Reference number for this case: 7-Oct-54-La-Ferté-Macé. Thank you for including this reference number in any correspondence with me regarding this case. Paris. -- Clear recrudescence of activity of the flying saucers during the last weekend and not only in the sky of France. Mysterious craft, indeed, were seen in Cameroun, Namur, in Lebanon, in Egypt and Germany. The appearance in Cameroun deserves a particular attention. In Yauondé [the capital], a certain number of people were together at the head doctor of the hospital, Dr. Menu, and were on the point of going to the movies when they were puzzled by the attitude of the dog who suddenly started to grunt and whose hairs stood up. Thinking that strangers were on the prowl near his residence, Dr. Menu went outside and saw, in the sky, a brilliant object. He immediately called his guests who all then stated to have seen, almost at the vertical of the plate where the hospital is located, an enormous violently illuminated disc, motionless at an altitude of approximately 600 meters. This "appearance" lasted fifteen seconds. The machine had very exactly the shape of a mushroom, i.e. a very illuminated disc, whose people present could not evaluate the diameter exactly, under which a cylinder of a length equal to the diameter of the hat swung very gently, also very illuminated. Suddenly, the craft took the direction of the East and its volume seemed to decrease at eyesight. Then it was immobilized during a few seconds before taking altitude quickly and disappearing. The witnesses of this phenomenon are worthy of faith, since, in addition to Dr. Menu, they were colonel Cauvin, head of the services of hygiene and the disease prevention of Cameroun; Misters Dumont, director of the Services of Safety of Cameroun; Poilleux, adviser of the territorial Assembly of Cameroun; Moreau, administrator, assistant mayor of Yaoundé and their wives. Close to Namur, the rural mailman made its usual round, when he saw a flying cigar which rose towards the sky at his approach at a vertiginous pace. However, he had the time to clearly distinguish on board two "roughly human" silhouettes. In Lebanon, it is a German firm's representative in Beirut, Mr. Max Favell, who stated to the newspaper "L'Orient" to have seen Saturday evening, at the seaside, a motionless machine in the sky which emitted a whitish light. The machine landed a few moments, then rose suddenly vertically without leaving traces. Several hundreds of Alexandria residents followed the maneuvers of a luminous object which changed from the red to the orange and the green to the blue gray. The observatory of Helouan, close to Cairo, was alerted, but before the special telescope could be set up to photograph it, the craft had disappeared. The sub-manager of the observatory, Mr. Azouz Ismail, stated that it was undoubtedly an aurora borealis, for a magnetic storm was observed since forty-eight hours. An extremely probable scientific explanation. "Four men in rubber outfits"
A movie projectionist of Munster, Mr. Willi Hoge, declared that, going back home in the suburbs of Munster, Saturday after midday, he saw in a field at about fifty meters of the road, a rather sharp blue gleam. Believing initially that it was a broken plane, he approached a few meters and then saw a machine having the shape of a cigar and immobilized in the air at approximately 1 m 50 from the ground. Under the craft, surrounded by a bluish gleam, the movie projectionist distinguished four "men" whose size was approximately 1 m. 20. These beings had, according to him, a rather broad chest, a head proportionally too large for their bodies and thin legs. Mr. Hoge specified that they wore a kind of combination whose fabric resembled rubber. Not daring to approach more, the witness restricted himself to observe the whereabouts of the occupants of the craft. After ten minutes, the crew went up on board using a kind of ladder, and the craft rose quickly almost vertically, taking, after a few seconds of rise, the shape of a brilliant disc. Mr. Willi Hoge finally claimed to have tried that very evening to cause an investigation, but he added that no police officer had agreed to go to the site to check his statements! Lastly, close to Frankfurt, thirteen pilot pupils of a sailplane school followed the maneuvers of their teacher when they had their attention drawn by an "extremely reinflated silver disc" which moved without the least noise. In France, in the long list of the celestial appearances, it is necessary to note in particular the unexpected meeting which Mr Roger Barrault, workman in Lavoux (Vienna) made. Mr. Barrault drove a bicycle, Saturday evening, around 7 p.m., when he was stopped short on the road by a double beam of light emanating from a kind of "diver" hardly 1 m. 50 tall, with boots without heels, very brilliant eyes and a big moustache! He must however have been a good man, for he walked one minute on the road without making the least evil to the awestruck Mr. Barrault who saw him disappearing in the nearby forest, walking. New fact also in Mâcon where circulating on the bridge of Saint-Laurent-les-Mâcon who spans the rivers Saône, several people saw a disc, which for once was not brilliant, but dark. In Tourriers, close to Angouleme, and in la Ferté-Macé (the Orne) it was two cigars who held the attention of the Sunday strollers, while a convex ball of fire shaved the summit of the trees in Beauvain, in the Orne too, under the amazed eyes of Mr. Christian Couette. PARIS. -- Several people have seen, on the bridge of Saint-Laurent-les-Mâcon, above the Saone, a disc which disappeared after a short moment. New fact: this disc was not shining but dark. A workman, Mr. Magnier, and truck-drivers, saw a luminous ball which crossed the sky at high speed in Montluçon. In Tourriers, at 17 km of Angouleme, about thirty people saw in the night of the 8th to the 9th a "kind of cigar" which remained motionless at forty meters above national road N 10 during about twenty minutes. The machine which was equipped with two winglets then decided to leave at a speed of approximately 250 to 300 km-H.
Mrs. Lebert, guardian of the castle of Pont-Chapelle, in La Ferté-Mace (the Orne), observed in the afternoon a mysterious machine in the sky. This machine which resembled a rocket, rose silently vertically leaving a light white trail behind. It could be observed during several seconds then disappeared quickly. A woman and children remaining in the suburbs of the locality were also witnesses of the phenomenon. Mr. Christian Couette, son of a plumber of Tesse-la-Madeleine, rode a bicycle in direction of Ranes, when, close to the pond to Landes-Forêt, on the commune of Beauvain, was exceeded by a strange luminous machine which, at a high speed, shaved the top of the trees. The machine approximately 4 meters in diameter had the shape of a ball of fire convex on the top. It was to be observed during ten seconds. YAOUNDE. -- Several people worthy of faith state they witnessed one of these phenomena which one calls "flying saucer". They are colonel Cauvin, director of the service of Hygiene and Disease Prevention of Cameroun, Doctor Menu, head doctor of the Yaoundé hospital, Misters Dumont, director of the services of safety of Cameroun, Poilleux, adviser of the territorial assembly of Cameroun, Moreau, administrator, assistant mayor of Yaoundé and their wives. All these people, gathered at the head doctor of the hospital, prepared to go to the movies, when they were intrigued by the attitude of the dog of the house who, suddenly started to grunt and roughcasting its hair. Thinking that foreigners prowled near his residence, Dr. Menu went outside and saw in the sky, a brilliant object. He immediately called his guests who all, then, stated to have seen, almost at the vertical of the plate where the hospital is located, an enormous violently illuminated disc, motionless at an altitude of approximately 600 meters. This "appearance" lasted fifteen seconds. The machine had very exactly the shape of a mushroom i.e. a very illuminated disc, whose people present could not evaluate the diameter exactly under which a cylinder a length equal to the diameter of the hat and also very illuminated swung very slightly. Suddenly, the "saucer" took the direction of the east and its volume seemed to decrease at eye sight. Then it was immobilized during a few seconds before taking altitude quickly and disappearing. BEIRUT. -- The newspaper "L'Orient" reports a statement by Mr. Max Favell, representative of a German firm in Beirut, who claims to have seen Saturday around 10:15 p.m. (loc.) at the seaside, a motionless machine in the sky which emitted a whitish light. Mr. Favell specified that the machine which was within a few meters of the ground landed for a few seconds then took off vertically while rotating to soon disappear in the sky. The witness did not notice any trace on the ground at the place of the landing of the machine. Following the publication of this declaration, a journalist, Mr. Abdelkarim revealed that he had also seen the same day, but towards 7 p.m., a kind of ball of red color moving in the sky and coming from the north. Mr. Abdelkarim fearing that little credit would be granted to his "vision" had not revealed it to anyone. One of our readers residing in Saint-Anthony reports he saw, Sunday evening, a brilliant object in the shape of a disc above the sea, between 11 p.m. and midnight. Suddenly, "the machine" started at very high speed in direction of the South-west. ...a new testimony to be poured into the "unidentified machines" file. In his pages relating sightings for October 7, 1954, Aimé Michel briefly mentions some additional sightings without providing the details, among them a daylight sighting in La Ferté-Macé which was of "a flying object seen from the ground." The author indicates that on October 7, 1954, luminous discs, landing or not landing, were reported among other places in la Ferté-Macé. Luc Chastan indicates that in La Ferte Macé on October 7, 1954 at an unknown time, there was an observation of a kind of rocket rising silently vertically with a white trail. The sources are indicated as "M.O.C. by Michel Aimé ** Arthaud 1958" and "Le Dauphiné Libéré". The website indicates that on 7 October 1954 at 15:00 at La Ferte-Mace, France, a daytime disc was reported. Not looked for yet. Probable jet plane and its contrail. [le1] Article in the regional newspaper L'Est Républicain, France, October 12, 1954. 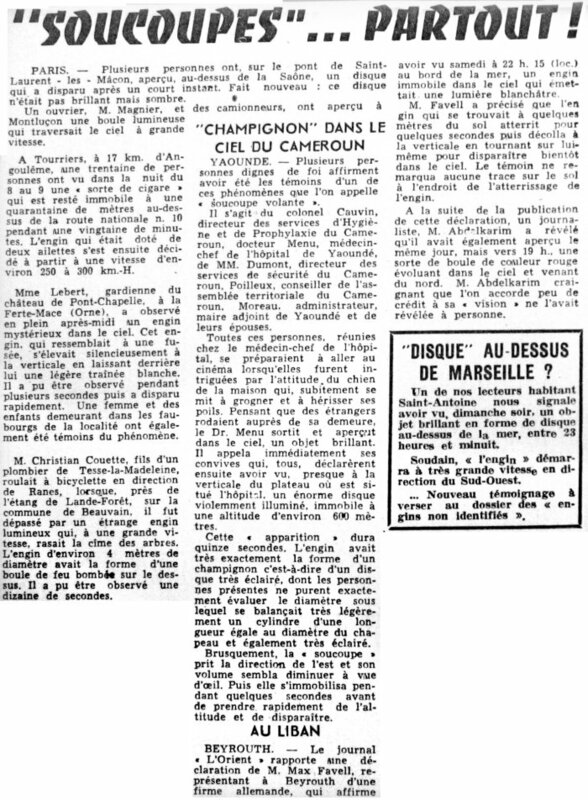 [lm1] Article in the regional newspaper Le Méridional, France, page 12, October 12, 1954. [---] Article in the regional newspaper Le Dauphiné Libéré, Savoy, France. [am1] "Mystérieux Objets Célestes", book by Aimé Michel, Seghers publisher, France, page 195,196, 1977. 1.0 Patrick Gross January 3, 2009 Conversion from HTML to XHTML Strict. First formal version. Additions [lc1], [ud1]. 1.2 Patrick Gross June 6, 2010 Addition [le1]. 1.3 Patrick Gross June 16, 2010 Addition [lm1]. In "Explanations", addition of "Probable jet plane and its contrail." 1.4 Patrick Gross September 24, 2014 Addition [cr1]. 1.5 Patrick Gross February 20, 2017 Addition [ub1].